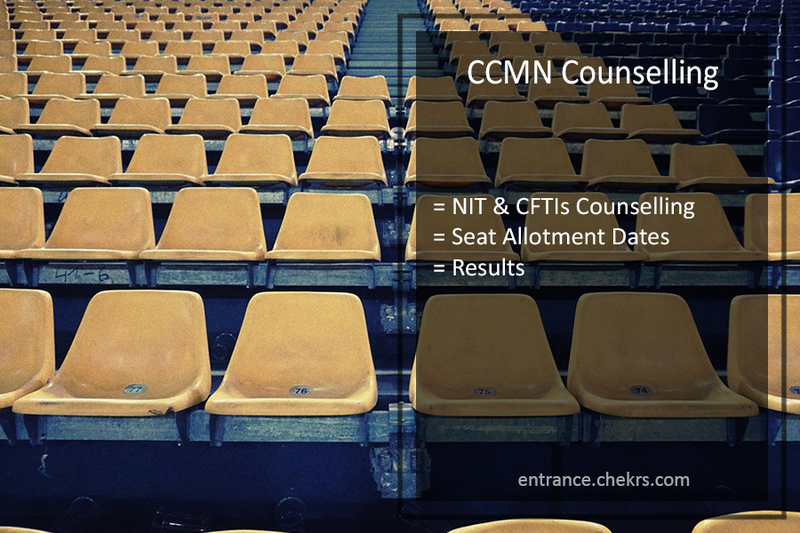 CCMN Counselling 2019: The National Institute of Technology Rourkela is going to organise the centralised counselling for the admissions in MSc Courses. The admissions to the NITS and CFTIs will be given through the JAM Counselling 2019. Latest Update: CCMN Counselling payment through bank begins from June 7, 2019. Check here complete schedule of CCMN Couselling 2019. The students have to register themselves for the counselling process. Only those students will be able to perform CCMN Registrations, who will clear the cutoff marks for the JAM exam. The registration starts from May. The students will be allotted seats in eighteen different NITs and CFTIs. The students who have qualified the JAM 2019 Exam and have submitted the CCMN Registration Fee, they can now join the counselling process. The seats will be allotted to the candidates according to the IIT JAM Seat Matrix. The students can check the second round allotment result in June. They can pay the counselling participation fee for the IIT JAM second Round Counselling in June 2019. They can even surrender their seats. The last date for the surrender of the allotment is July. The Final Round Results will be announced in July 2019. 2 Payment of Counselling Participation Fee (CPF) through ICICI Bank Eazypay and Submission of option “Accept and Freeze” OR “Accept with Upgrade” for Second Round Fresh Allotted Candidates. First Round CPF paid candidates, who opted “Accept with Upgrade” option may excercise their option again. 3 Payment of Counselling Confirmation Fee (CCF) Rs 5,000/- through ICICI Bank Eazypay and Submission of option “Accept and Freeze” OR “Accept with Upgrade” for all First and Second Round CPF paid Candidates. If First and Second Round CPF paid Candidates, those who have not surrendered their seats between “29-Jun-2019” and “07-Jul-2019” want to SURRENDER their seat may choose “Reject and Quit” option without paying CCF. 4 Payment of Counselling Participation Fee (CPF) and Counselling Confirmation Fee (CCF) through ICICI Bank Eazypay and Submission of option “Accept and Freeze” OR “Accept with Upgrade” for all Third Round Fresh Allotted Candidates. The students will be shortlisted according to their IIT JAM Scorecard. The authorities will prepare an IIT JAM Counselling List through which the students will be called for the allotment. The registered students have to pay the counselling joining fee after declaration fo the results of each round. The CCMN Counselling Result will be announced at the end of each round. The students can also check the centralised counselling for MSc first and second round result here. We have provided a link through which you can check the closing rank for the counselling. The Indian Institute of Technology conducted the JAM exam for the students whoa re seeking admission in MSc courses. The NIT Rourkela will Declare the Final Vacancy on 5th July. If any seat remains vacant they can conduct an another round of the counselling. 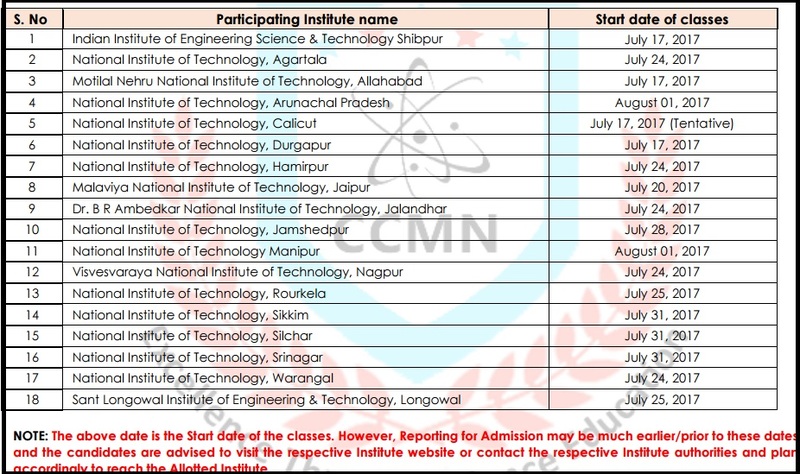 The students can also check the joining dates of the institutes given in the image above. For feedback and more queries regarding CCMN Counselling 2019, you can contact us by commenting in the comment section given below.